Meet today’s storage needs and prepare for the growing demands of tomorrow with the Intel SSD 660p Series built on Intel QLC 3D NAND technology. The Intel SSD 660p is the first QLC-based client PCIe SSD in the industry, continuing Intel’s leadership in flash cell technology and quality manufacturing. The SSD 660p finally fits low-cost and high-capacity into one drive. • Empowered by Intel’s innovative Intel QLC technology, the Intel SSD 660p offers higher capacities at a lower cost than TLC-based options. With PCIe, the new SSD 660p skips SATA and its limitations to offer up to 2TB in one drive. • These client SSDs pack more data than TLC-based storage, allowing up to 2x more capacity in identical footprints. The thin M.2 80mm form factor makes it perfect for notebooks, desktops, and mobile devices that need storage for everyday computing. 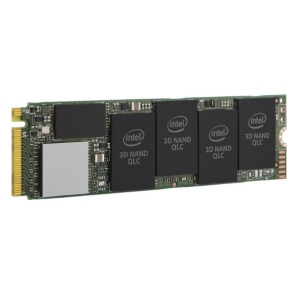 • The architecture of Intel QLC technology in the SSD 660p is made to intelligently boost performance. QLC and SLC “spans” on the drive adjust bi-directionally based on used capacity for the life of the product. Increases in capacity usage trigger the SLC span to decrease, and decreases in capacity usage trigger the SLC span to increase. • The SSD 660p hits the marks that matter for client SSDs. This drive is tuned to deliver a capacity optimized NVMe performance and deliver an intelligent storage option for mainstream and entry-level computing.